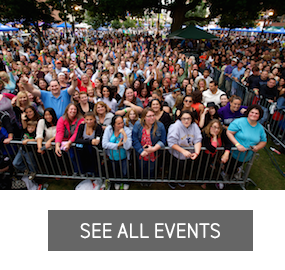 Holiday Light Program | Stamford Downtown - This is the place! Stamford Downtown boasts as one of the best holiday light programs in the region. With our majestic Oak Tree in Columbus Park, the “dripping lights” at Kiwanis Park, our city center tree at the entrance of the Ferguson Library or our perennial Holiday Tree and festive display along Bedford Street leading the Latham Park. It is truly a work of art. We take such pride in this display of festive lights that we leave them lit until early spring! We hope you enjoy this fabulous light display and come downtown during the months of November to March to absorb its beauty! Eighty (80), fifteen foot (15’) to fifty foot (50’) deciduous trees. e. Begin lighting trees at approximately twelve feet (12’) off ground. a. Miniature, LED, cool-white, non-blinking lights. d. Program multiple timers to phase non-flashing and strobes. e. Install star (or other tree topper) (Stamford Downtown to provide). f. Approximately one-Hundred (100), six-to-fourteen inch (6”-14”) ornaments. b. Ten (10) rods per tree (Stamford Downtown will provide the rods. The selected contractor will inventory condition and order replacements as needed). a. Install sixty (60), twenty-four inch (24”), 120 volt light rods to pre-installed clips mounted on building walls. c. Provide power from pre-established building roof sources. Twenty-eight (28), fifteen foot to (15’) to fifty foot (50’) deciduous trees. 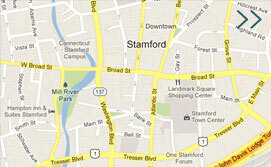 Prior to installation, Stamford Downtown will require a contractor/client site walkthrough to finalize specific trees.